This posting is of course open to comments and any other shots of decorative Duple double deckers. Another Red & White subsidiary, Cheltenham & District, took delivery of five virtually identical vehicles to the above in 1950/51, running them until 1966. 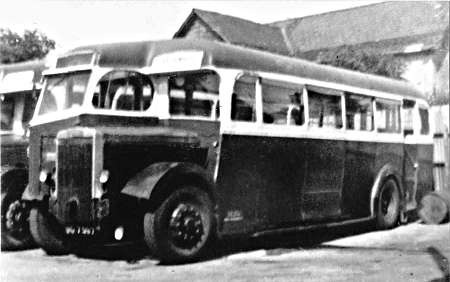 There was discussion with the Eastern Scottish Regent as to whether there were only lowbridge versions of this handsome bodywork, The book ‘Cheltenham’s Buses 1939-1980’ shows them to be H31/26R, and from a close look at the photos, I believe that they were highbridge examples. They, too, had the thick aluminium strip, although they did not have a safety bar across the front upstairs windows inside. 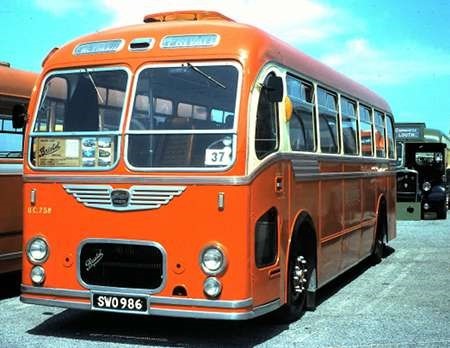 Fleet numbers were 74-78 (JDG786-790). 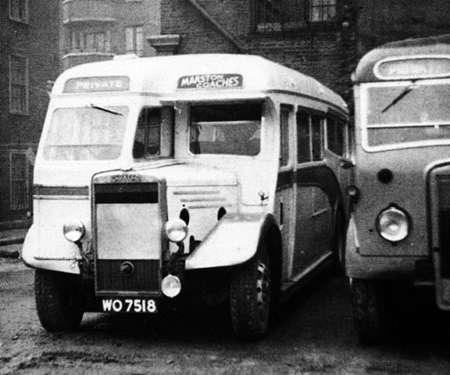 Of course, Red & White also supplied some new Duple-bodied Guy Arab Mk111’s to its subsidiary fleets, including 4 to Venture of Basingstoke (HOT 391-4) with highbridge bodies and 2 lowbirdge examples to Newbury & District Motor Services (FMO 515/6), along with a highbridge example (FMO 517). The latter was originally intended for Venture, and after a short time the Basingstoke examples were transferred to the N&D fleet in the interests of standardisation. 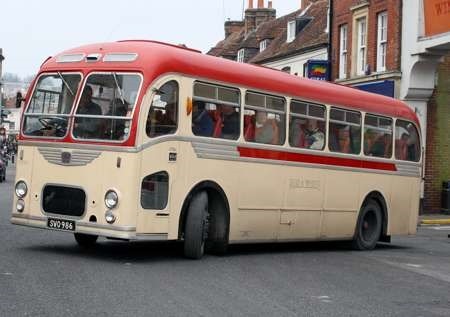 All then remained in service at Newbury until withdrawal in 1968. You can read the full story in my new book The Newbury & District Motor Services Story. One day I was driving towards Bolton through the Lancashire town of Leigh. I am sure I saw a Guy Arab in Red and White very faded colours parked in a mill. I assume it had been or was being used as a staff bus for the mill workers. This must have been around the mid 1980’s. Has anyone any information on the fate of the vehicle. These where ordered by Red & White; but arrived shortly after a depot swop with Bristol Omnibus; Stroud and Cheltenham went to B.O.C. 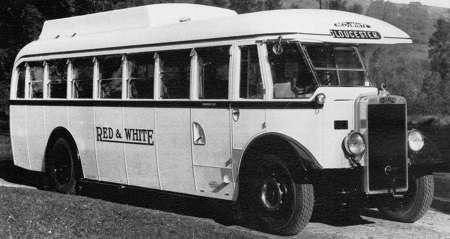 while R & W had services in the Forest of Dean/Wye Valley/Hereford from B.O.C. They had high bodies no rear doors, and spent most of their days on the St. Marks routes, in Cheltenham. Lovely buses even to the end of their days, The Red & White ones were low bodies with doors and ran in the Forest/Monmouth area. The sad point being Cheltenham District did not fit in with B.O.C. as well as it did with Red & White. 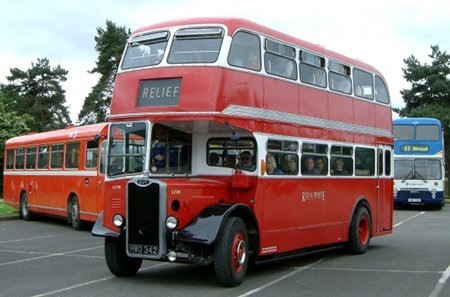 Red & White retained its Coach operation, at Montpellier Spa Depot, for a number of years, before basing its Cheltenham Coaches at the Black & White Coach Station for a number of years, until the birth of National Express.